** It is important to remember that when it comes to a battery that the negative terminals are black and the positive terminals are red. It is typically the standard when it comes to batteries. Also, a great tip is to have the jumper cables separated before you start connecting. You are going to want to position the vehicle that can give the not starting vehicle so that the jumper cables can reach. Both vehicles should be in the park and shut off when you initiate. Next, you are going to want to open the hoods of both vehicles. So you can have access to the battery and can connect the jumper cables. 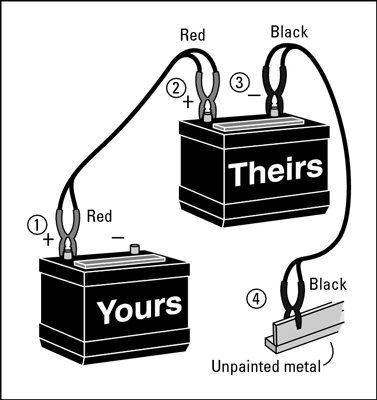 To begin connecting with the jumper cables, you will want to first clamp the positive (red) cable to the red terminal of the battery that has died. Once you begin connection, don’t allow the jumper cables to touch each other. Then you will want to connect the other side of the jumper cables, positive (red) to the other car with a good battery. 5. You will then need to connect the negative (black) cable to the other vehicle’s negative battery terminal. For the last jumper cable, you will want to clamp on a piece of unpainted metal on the car requiring the jump, and not use the actual negative terminal on its battery. You should choose a location that isn’t near the battery. It can be the hood hinges (if applicable) or possibly a hood latch. Now it is time to start the vehicle that is giving the jump. You will want to let it run for a few minutes. Sometimes it can help if you give it a few revs. Keep the cables connected for about 5 minutes to give the battery time to charge. Start the vehicle with the dead battery. If it starts, that’s great! Don’t shut it off! Disconnect the cables following the steps backward from attaching. You will want to drive your vehicle for 10 to 15 minutes to get your battery recharged. That’s it! This simple guide will help anyone that needs to jump start a vehicle. If after the jump, your car runs, but you shut it off and won’t start again, it is more than likely that your battery is too far gone and you will need to replace it.